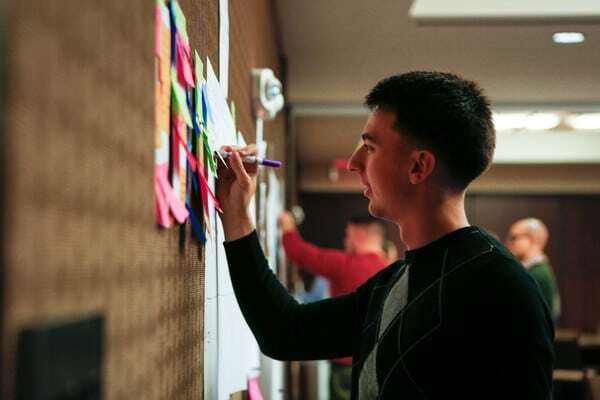 CAMP LEJEUNE, North Carolina — More than 30 Marines and Sailors with 2nd Marine Logistics Group participated in the first Innovation Bootcamp at Jacksonville, N.C., Dec. 10-14, 2018. The week-long course was facilitated by MD5: Defense Innovation Accelerated, a national security technology accelerator, and 2nd MLG leadership to promote creative and innovative thinking. The Marines and Sailors worked in small teams on a unique project blueprinted to enhance combat readiness in the command. Like the symposium, this course focused on applying human-centered design, problem framing, Lean LaunchPad, Mission Model Canvas, and minimum viable product concept to solve 2nd MLG problems. The training was led by Sophi Martin, innovation director and lecturer with the Blum Center for Developing Economies, University of California, Berkeley, and Vivek Rao, a lecturer with the Haas School of Business. To conclude the course, the teams pitched their ideas to a panel comprised by the 2nd MLG leadership and Tommy Sowers, MD5’s Southeast Regional Director. The panel picked some of the ideas for further development and implementation within the command. The way ahead is for the bootcamp participants to take what they learned during the course and apply it to at their units while passing to other members the same problem-solving methodology.